This is an annual conference that grew out the a one-off event organized speculatively two years ago. To the surprise and delight of all involved, it attracted a large and engaged crowd of people wanting to hear about and discuss Catholic literature. Now in its third year, it has become an established annual event. 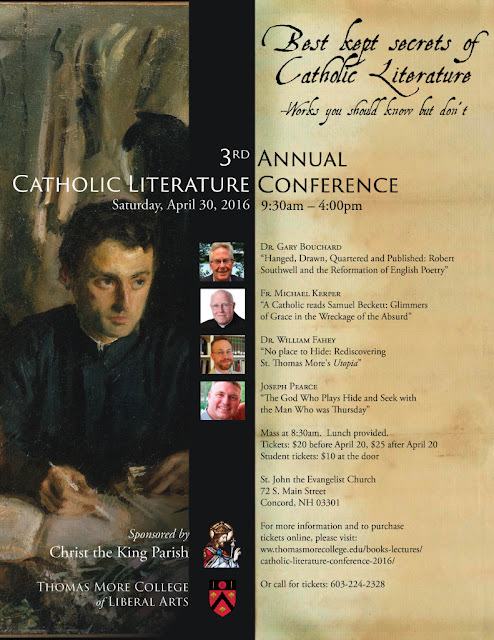 The speakers this year are Joseph Pearce, Gary Bouchard, William Fahey, president of Thomas More College, and Fr Michael Kerper, pastor of St Patrick’s in Nashua, New Hampshire. For more details go to the Thomas More College site, here. You save $5 if you book before April 20th.